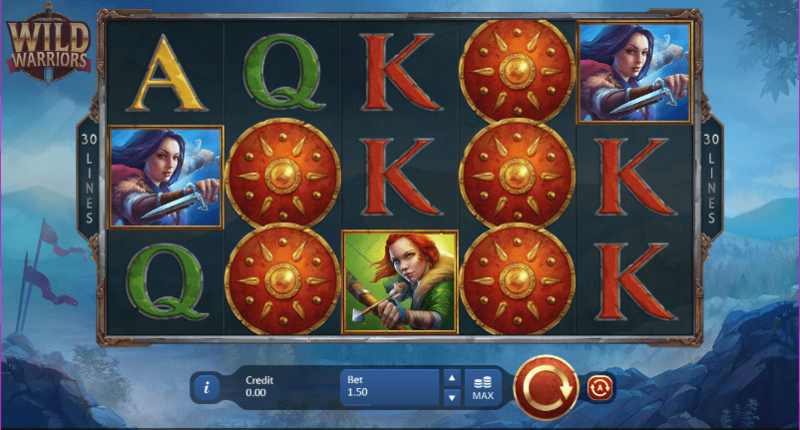 Wild Warriors is a UK online slots game from developer Playson. Adopting swords and sorcery type fantasy theme, the narrative of the game involves a band of female warriors getting together and going out on mystical adventures. The graphics used include swords, shields and a host of other medieval weapons and armour. If you like Lord of the Rings type movies, you will more than likely enjoy a few spins on Wild Warriors. This five-reel, 30-payline slots online game has plenty of innovative and interesting features that will keep you coming back to it, time after time. Mist blows across mountains and flags flutter in the background, and the game’s lower value symbols are shields and letters. The symbols to keep a look out for are a panther and four warrior women. The game’s wild is the Wild Warriors icon. The most valuable of the four warrior women symbols is the one depicting the blonde warrior. She will bring you luck, in the form of payouts of up to 1.6x your stake per payline. The Wild Warriors icon is the game’s wild, which can land on all five reels. If you spin in five wilds in combination you’ll receive a payout of 33.33x your stake. The game’s scatter symbol is the round shield, which can appear on the middle three reels only. If you manage to spin in seven, eight or nine of these symbols on the same spin then you you’ll receive a payout which is double your stake, as well as triggering the Free spins feature. This feature awards you eight, 12 or 25 free spins. Play more at slotsbaby.com. Playson is a games development company which is based in Malta, and holds a licence from the UK Gambling Commission. Employing over 250 staff across the world, over 40 Playson titles make use of Omni-Channel HTML5 technology. As well as slots games, they also produce versions of online casino table games like roulette. You can find their games in many an online UK casino. If you enjoy playing fruit machines then there is a good chance that you have played a Playson game on many previous occasions. Overall, Wild Warriors offers plenty of opportunities to win good prizes, and have lots of fun along the way. The wild women warriors of the game offer up an engaging storyline, which should bring gamers back to this slots game time after time. Ideal for fans of slot games online for free and swords and sorcery type fantasy stories, this game can be enjoyed by all fans of online slots gaming. It is also well worth looking out for other games from Playson.